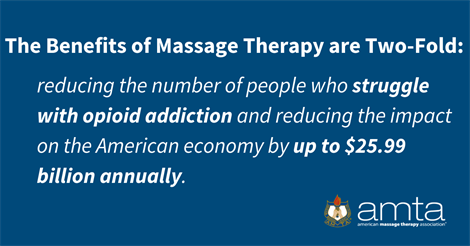 New research indicates the use of massage therapy instead of opioid medication (for conditions where massage is proven effective) can reduce costs to the American economy by up to $25.99 billion annually. These are the results of an economic modeling analysis commissioned by the American Massage Therapy Association (AMTA)1. This analysis examines the costs and benefits of replacing opioid pain killers with massage therapy where evidence indicates it is appropriate and effective. The President’s Council of Economic Advisors (CEA) estimated that in 2015, the cost of the opioid crisis was $504 billion2. According to the Joint Commission3, non-pharmacologic approaches such as massage therapy can replace opioids for many types of pain. The number of patients who could be treated either by massage therapy or opioid prescriptions was determined through analysis of data published by the Center for Medicare and Medicaid Services in a 2015 report4. The number of individuals with the potential to benefit from massage therapy can be as many as 5 million patients in the U.S., with the potential to reduce the number of people with addiction disorder by 111,137 per year. This projection suggests providing massage therapy as a tool for pain management instead of opioids could save the United States between $23.59 and $25.99 billion annually in social and economic costs associated with early death, treatment and crime prevention.